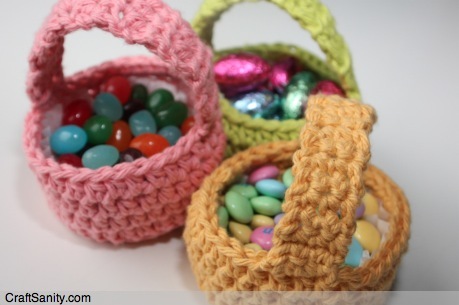 This mini basket pattern is inspired by my Great Grandma who used to crochet little baskets around butter tubs for the little girls in the family. Read on for the pattern and happy stitching! Hdc: half double crochet… To create a half double crochet stitch wrap the yarn around your hook and pull a loop up as if to do a double crochet, but instead of working off two loops at a time, draw the yarn through all three loops on the hook to complete the stitch. Begin with a magic loop OR ch 4 and sl st into first chain to form a loop. Round 1: Make six 6 hdc stitches into ring. Sl st into first st to complete round. (6 sts.) Ch. 1. Round 2: 2 hdc in each st around. Sl st into first st to complete round. (12 sts.) Ch. 1. Round 3: 2 hdc in each st around. Sl st into first st to complete round. (24 sts.) Ch. 1. Round 4: * Hdc in next two sts, 2 hdc in next st. * Repeat from * to * around. Sl st into first st to complete round. (32 sts.) Ch. 1. Round 5: Hdc in each stitch around, working only in the back the back half of the sts from previous round. This will create a ridge along the bottom edge of the basket. Sl st into first st to complete round. (32 sts.) Ch. 1. Rounds 6-8: Hdc in each st around. Sl st in 1st st. of round. Ch 1. After completing round 8 do not cut off yarn. Ch 1 and do 3 hdc, then ch 1 & turn. Repeat * 3 hdc, ch1 & turn * 15 times to create handle. Do not chain 1 at the end of the final row. Just cut the yarn leaving a 12” tail and fasten off. 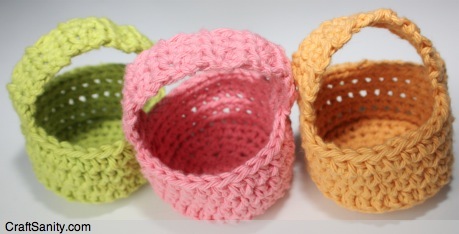 Use a yarn needle to whip stitch the handle to the basket. * This pattern is copyrighted 2012 by Jennifer Ackerman-Haywood, CraftSanity Magazine Publisher, art and craft columnist, podcast host and blogger at CraftSanity.com. 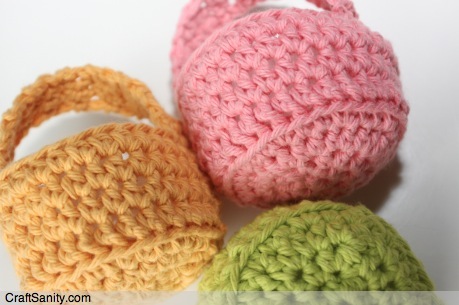 You may use this pattern to create items for non-commercial sale, if you credit CraftSanity.com as the pattern source. Please don’t distribute copies of this pattern, but feel free to refer people to this link. Thank you! inclus un Call of Duty Spirits Hack dans le marché de notre logiciel. obviously like your web-site but you have to test the spelling on several of your posts. Several of them are rife with spelling problems and I find it very bothersome to tell the reality then again I’ll surely come back again.